Even today, one of the most important tools for studying microorganisms is the light microscope, which, like van Leeuwenhoek's instrument, uses visible light for observing objects. These instruments can magnify images approximately 1,000x, making it relatively easy to observe the size, shape, and motility of prokaryotic cells. The electron microscope, introduced in 1931, can magnify images in excess of 100,000x. This microscope revealed many fine details of cell structure. A major advancement came in 1981 with the introduction of the first scanning probe microscope. This, in turn, led to even more sophisticated technologies that allow scientists to view individual atoms. The types of microscopes are summarized in table 3.1. In light microscopy, light typically passes through a specimen and then through a series of magnifying lenses. The most common type of light microscope, and the easiest to use, is the bright-field microscope, which evenly illuminates the field of view. Visible light passes through a series of lenses to produce a magnified image. Relatively easy to use. Considerably less expensive than confocal and electron microscopes. Illuminates the field of view evenly. 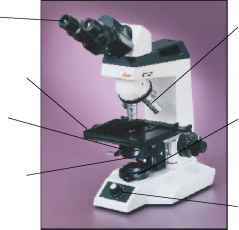 Most common type of microscope. Amplifies differences in refractive index to create contrast. Makes unstained cells more readily visible. Two light beams pass through the specimen and then recombine. Causes the specimen to appear as a three-dimensional image. Light is directed toward the specimen at an angle. Makes unstained cells more readily visible; organisms stand out as bright objects against a dark background. Projects ultraviolet light, causing fluorescent molecules in the specimen to emit longer wavelength light. Used to observe cells that have been stained or tagged with a fluorescent dye. Mirrors scan a laser beam across successive regions and planes of a specimen. From that data, a computer constructs an image. Used to construct a three-dimensional image structure; provides detailed sectional views of intact cells. Use electron beams in place of visible light to produce the magnified image. Can clearly magnify images 100,000x. Transmits a beam of electrons through a specimen. Elaborate specimen preparation, which may introduce artifacts, is required. A beam of electrons scans back and forth over the surface of a specimen. Used for observing surface details; produces a three-dimensional effect. Make it possible to view images on an atomic scale. Produce a map showing the bumps and valleys of the atoms on that surface. A sharp metallic probe causes electrons to tunnel between the probe and a conductive surface. First scanning probe microscope developed. A tip bends in response to even the slightest force between it and the sample. Can operate in air and in liquids. microscope (figure 3.1). These lenses in combination visually enlarge an object by a factor equal to the product of each lens' magnification. For example, an object is magnified 1,000-fold when it is viewed through a 10x ocular lens and an objective lens with a power of100x. Most compound microscopes have a selection of objective lenses that are of different powers—typically 4x, 10x, 40x, and 100x. This makes a choice of different magnifications possible with the same instrument. The condenser lens does not affect the magnification but, positioned between the light source and the specimen, is used to focus the illumination on the specimen. Iris diaphragm. Controls the amount of light that enters the objective lens. The usefulness of a microscope depends not so much on its degree of magnification, but on its ability to clearly separate, or resolve, two objects that are very close together. The resolving power is defined as the minimum distance existing between two objects when those objects can still be observed as separate entities. The resolving power therefore determines how much detail actually can be seen (figure 3.2). Resolving power of a microscope depends on the quality and type of lens, magnification, and how the specimen under observation has been prepared. At higher magnifications it can also be limited by the wavelength of the light used for illumination. The shorter the wavelength, the greater the resolution. The maximum resolving power of the best light microscope is 0.2 mm. This is sufficient to observe the general morphology of a prokaryotic cell but too low to distinguish a particle the size of a virus. 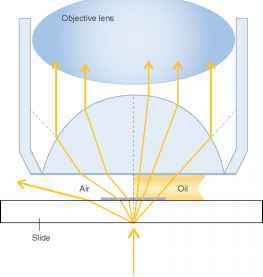 To obtain maximum resolution when using certain highpower objectives such as the 100x lens, oil is used to displace the air between the lens and the specimen. This avoids the bending of light rays, or refraction, that occurs when light passes from glass to air (figure 3.3). Refraction can prevent those rays from entering the relatively small openings of higher-power objective lenses. The oil has nearly the same refractive index as glass. Refractive index is a measure of the relative velocity of light as it passes through a medium. As light travels from a medium of one refractive index to another, those rays are bent. When oil displaces air at the interface of the glass slide and glass lens, light rays pass with little refraction occurring. Contrast reflects the number of visible shades in a specimen— high contrast being just two shades, black and white. Different specimens require various degrees of contrast to reveal the most information. One example is bacteria, which are essentially transparent against a bright colorless background. The lack of contrast presents a problem when viewing objects (see figure 11.19). One way to overcome this problem is to stain the bacteria with any one of a number of dyes. The types and characteristics of these stains will be discussed shortly. A number of lenses that provide different magnifications. The total magnification is the product of the magnification of the eyepiece lens and the objective lenses. Light source with means to control amount of light. Knob to control intensity of light. Figure 3.1 A Modern Light Microscope The compound microscope employs a series of magnifying lenses. Special light microscopes that increase the contrast between microorganisms and their surroundings overcome some of the difficulties of observing unstained bacteria. Staining kills microbes; therefore, some of these microscopes are invaluable when the goal is to examine characteristics of living organisms such as motility. Figure 3.2 Comparison of the Resolving Power of the Light Microscope and an Electron Microscope In this case, an onion root tip was magnified 450x. Note the difference in the degree of detail that can be seen at the same magnification. Figure 3.3 Refraction As light passes from one medium to another, the light rays may bend, depending on the refractive index of the two media. 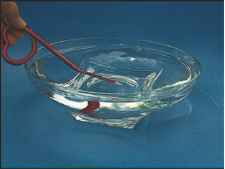 (a)The pencil in water appears bent because the refractive index of water is different from that of air. (b) Light rays bend as they pass from air to glass because of the different refractive indexes of these two media; some rays are lost to the objective. Oil and glass have the same refractive index, and therefore the light rays are not bent. resulting in a darker appearance of the denser material (figure 3.4). As light passes through cells, it is refracted slightly differently than when it passes through its surroundings. Special optical devices amplify those differences, thereby increasing the contrast. Figure 3.4 Phase-Contrast Photomicrograph Filaments of a species of the cyanobacterium Lyngbya. Protozoan (Paracineta) attached to green algae (Spongomorpha) (320x). the specimen and then recombine. The light waves are out of phase when they recombine, thereby yielding the three-dimensional appearance of the specimen. (filaments), both of which are eukaryotes. Figure 3.7 Fluorescence Photomicrograph A rod-shaped bacterium tagged with a fluorescent marker. Treponema. These thin, spiral-shaped organisms stain poorly and are difficult to see via bright-field microscopy (see figure 11.27). 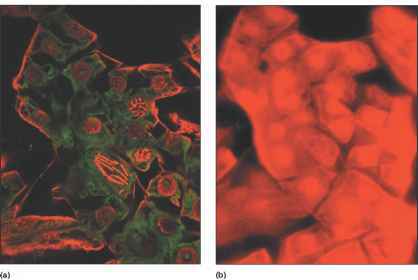 The fluorescence microscope is used to observe cells or other material that are either naturally fluorescent or have been stained or tagged with fluorescent dyes. A fluorescent molecule absorbs light at one wavelength (usually ultraviolet light) and then emits light of a longer wavelength. A common variation of the standard fluorescence microscope is the epifluores-cence microscope, which projects the ultraviolet light through the objective lens and onto the specimen. 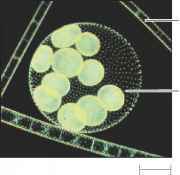 Because the light is not transmitted through the specimen, cells can be observed attached to soil particles or other opaque materials. computer then assembles the data and constructs a three-dimensional image, which is displayed on a screen. In effect, this microscope is a miniature CAT scan for cells. Frequently, the specimens are first stained or tagged with a fluorescent dye. By using certain fluorescent tags that bind specifically to a given protein or other compound, the precise cellular location of that compound can be determined. In some cases, multiple different tags that bind to specific molecules are used, each having a distinct color. Figure 3.8 Confocal Microscopy This technique can be used to produce a clear image of a single plane in a thick structure. (a) Confocal photomicrograph of fava bean mitosis. (b) Regular photomicrograph. Figure 3.9 Comparison of the Principles of Light and the Electron Microscopy For the sake of comparison, the light source for the light microscope has been inverted (the light is shown at the top and the eyepiece, or ocular lens, at the bottom). Figure 3.10 Transmission Electron Photomicrograph A rod-shaped bacterium prepared by (a) thin section; (b) freeze etching. Since the electrons have a wavelength about 1,000 times shorter than visible light, the resolving power increases about 1,000-fold, to about 0.3 nanometers (nm) or 0.3 x 10:3 mm. Consequently, considerably more detail can be observed due to the much higher resolution. These instruments can clearly magnify an image 100,000x. One of the biggest drawbacks of the microscope is that the lenses and specimen must all be in a vacuum. Otherwise, the molecules composing air would interfere with the path of the electrons. This results in an expensive, bulky unit and requires substantial and complex specimen preparation. 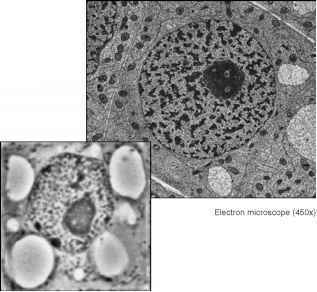 The transmission electron microscope (TEM) is used to observe fine details of cell structure, such as the number of layers that envelop a cell. The instrument directs a beam of electrons at a specimen. Depending on the density of a particular region in the specimen, electrons will either pass through or be scattered to varying degrees. The darker areas of the resulting image correspond to the denser portions of the specimen (figure 3.10). Transmission electron microscopy requires elaborate and painstaking specimen preparation. To view details of internal structure, a process called thin sectioning is used. Cells are carefully treated with a preservative and dehydrated in an organ ic solvent before being embedded in a plastic resin. Once embedded, they can be cut into exceptionally thin slices with a diamond or glass knife and then stained with heavy metals. Even a single bacterial cell must be cut into slices this way to be viewed via TEM. Unfortunately, the procedure can severely distort the cells. Consequently, a major concern in using TEM is distinguishing actual cell components from artifacts occurring as a result of specimen preparation. A process called freeze fracturing is used to observe the shape of structures within the cell. The specimen is rapidly frozen and then fractured by striking it with a knife blade. The cells break open, usually along the middle of internal membranes. Next, the surface of the section is coated with a thin layer of carbon to create a replica of the surface. This replica is then examined in the electron microscope. A variation of freeze fracturing is freeze etching. In this process, the frozen surface exposed by fracturing is dried slightly under vacuum, which allows underlying regions to be exposed. 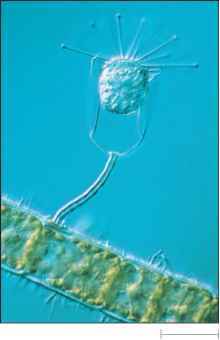 Figure 3.11 Scanning Electron Photomicrograph A rod-shaped bacterium. 3.2 Microscopic Techniques: Dyes and Staining and its surroundings. The fluorescence microscope is used to observe microbes stained with special dyes. The confocal scanning laser microscope is used to construct a three-dimensional image of a thick structure. Electron microscopes can magnify images 100,000x. Scanning probe microscopes map images on an atomic scale. ■ Why might oil be used when using the 100x lens? ■ Why are microscopes that enhance contrast used to view live rather than stained specimens? ■ If an object being viewed under the phase-contrast microscope has the same refractive index as the background material, how would it appear? Figure 3.12 Scanning Probe Photomicrograph DNA-protein complex. back into the viewing chamber. This reflected radiation is observed with the microscope. Relatively large specimens can be viewed, and a dramatic three-dimensional effect is observed with the SEM (figure 3.11). Scanning probe microscopes make it possible to view images at an atomic scale (figure 3.12). Their resolving power is much greater than the electron microscope, and the samples do not need special preparation as they do for electron microscopy. One such microscope, developed in the early 1980s, is the scanning tunneling microscope. This instrument has a sharp metallic probe, the tip of which is the size of a single atom. Electrons tunnel between the probe and a conductive surface. By scanning across a surface, this instrument produces a map, which shows the bumps and valleys of the atoms on that surface. A more recent instrument is the atomic force microscope, which has a tip that can bend in response to even the slightest force between the tip and the sample. By monitoring the motion of the tip as it scans across a surface, a map of the surface is produced. Unlike the scanning tunneling microscope, the atomic force microscope does not rely on a vacuum and thus can operate in air and in liquids. What makes unstained cells more visible? How to prepare a a rod shaped bactrium for trasmission microscopy? Which microscope amplifies differences in refractive index to create contrast? Which microscopic techniques does not produce a naturally colored image? Which of the following microscope techniques does not produce a naturally colored image? Why are microscopes that enhance contrast used to view live rather than stained specimens? What illuminates the field of view evenly ? How many magnification affect the visual structure when observing a specimen under a microscope? How to stain bacteria with dye and view under a fluorescence spectrometer? How magnification affects the visual structure when observing a specimen under a microscope? What are microscopic instrument and their characterestics? What are microscopic instrument and their characteristics? What are the microscopic instruments and their characteristics? Which microscope is usedvto observe three dimensional image? What is refractive index in microscopic techniques? How many instrument requre in microscope? How does phase contrast microscope differ from othercompound microscopes? WHAT IS A CONDENSER ALPF? Is microscope a device or instument? Why microscope that enhance contrast used to view live rather than stained specimen? What technique in microscopy is used to examine live organisms? What are the effects of microscopic techniques? What are the techniques of microscopyn?